Link two meetings to combine notes into single sequence. Link meeting enables user to merge two meeting sequences in one. There is one prerequisite to link meetings, user should be the organiser of both the meetings. Link Meetings enable you to organise notes better and keep relevant information together. 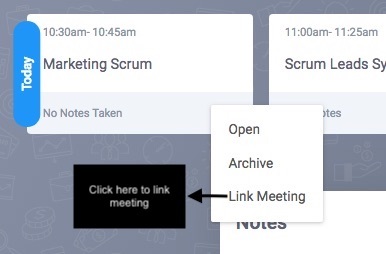 Click on the bottom right of the meeting card and hit "Link Meeting". Now, both the meeting series are linked and notes will be combined inside the editor. Please note that once meetings are linked this action can not be undone.